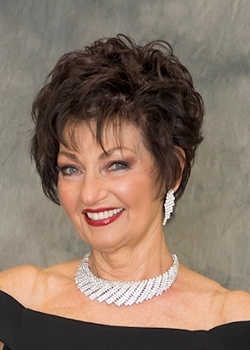 The Ms. Arizona Pageant is administered by the Ms Senior Arizona/ America organization under Directors Herme and Ken Sherry, with the help of Assistant Director Jean McCurdy, and Danny Davis. Herme reports that,"We have over 100 people who work on our Pageant in some area and everyone is a Volunteer! We are Blessed!!" Visit Arizona Senior America Pageant, or Arizona Cameo Foundation or contact Herme Sherry at msseniorarizona2004@cox.net for more information. Many thanks to Ms Sherry for years of wonderful pageants and phenomenal state queens! The 30th Annual Ms. Senior Arizona Pageant will be held at Valley Vista Performing Arts Center on Saturday March 30,2019 at 6:00 p.m. Make your plans to attend today! CONGRATULATIONS to CHERI SEITH, Ms Arizona Senior America 2018! Cheri grew up in the small town of Carrollton, Ohio. The oldest of two siblings, she describes her fond childhood memories as a true Norman Rockwell existence. Music has always been a part of Cheri�s life. She started studying piano at age 10 and still loves to play today. Cheri was very active in high school, performing and dancing in different school functions, fashion shows and sang in the choir. In her senior year she was voted Homecoming Queen. After graduating from business school in Columbus, Ohio she worked at Ohio State University but soon decided that she wanted to see the world. She was accepted as a stewardess for TWA traveling all over the world, meeting fascinating people for 25 years during the golden age of the airline industry. Cheri married her high school sweetheart, the love of her life. She said it only took 35 years to find each other again and have been married for 25 wonderful years. They both love animals and have been active with rescued Greyhound organizations for the past 20 years. Upon retiring, Cheri and her husband moved from Ohio to Surprise, Arizona where she continued her studies of music, dance and acting. She auditioned and was selected to perform in the front row with the International world champion Scottsdale Chorus. She next auditioned and was selected for leading roles in community theater as Annie Oakley in �Annie Get Your Gun�, Ado Annie in �Oklahoma�, Gladys in �The Pajama Game�, followed by roles in �The King and I� and �The Music Man�. Her versatility was shown in a dramatic role as prosecuting attorney in the play �Reasonable Doubt�. She also performed leading roles in three mini musicals created for her by Broadway Veteran, Alice Korsick. To enhance her public speaking abilities, Cheri joined Toastmasters International and has achieved the levels of Competent Communication and Competent Leader and is still active. Cheri recently has written, produced and directed her own one woman show called �Over the Rainbow�, a tribute to the great Judy Garland, performing her show before hundreds at senior communities all over the State of Arizona. She finds it such a joy to see their smiles and encourages them to find the joy in their life. Most recently she has been performing with the Swing Kings, a professional big band. Cheri and her husband are committed to staying healthy and have established a lifestyle of physical fitness and a healthy diet so that they can remain active and productive in their senior years together. As Ms. Senior Arizona, Cheri welcomes the opportunity to help further the cause of the Arizona Cameo Foundation, assisting with programs and services to benefit victims of domestic violence. She looks forward to encouraging those that she meets to stay active and enjoy life to the fullest. All Material Copyrighted � 1997-2019 by Senior America, Inc.